As home prices in the GTA went up by over 18% in 2016 compared to a year earlier, CMHC did something unexpected. It said in a recent report (pdf) that: "moderate or elevated evidence of overvaluation was detected in Hamilton and the GTA..., indicating that some of the price appreciation was not driven by fundamental factors." Seriously, I really don't understand CMHC. Let me explain why. Between 2013 and 2015 the average home prices in the GTA went up by 17%. And that's fine according to CMHC. Because apparently - "this substantial increase was due mainly to favorable economic conditions, population growth and relatively low mortgage rates, which increased demand for housing and drove up prices." 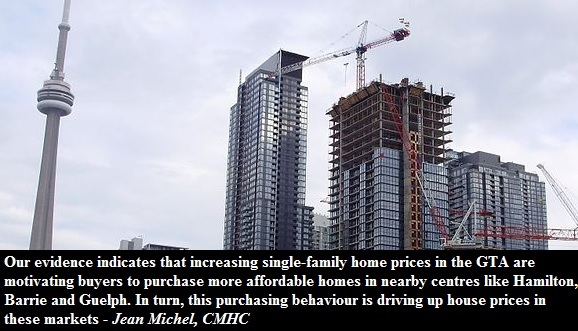 In other words, substantial price appreciation before 2016 was due to fundamental factors yet, as CMHC said, current price increases were not only driven by fundamental factors. Really? Let me show you a chart. Income is the most important fundamental in my books. 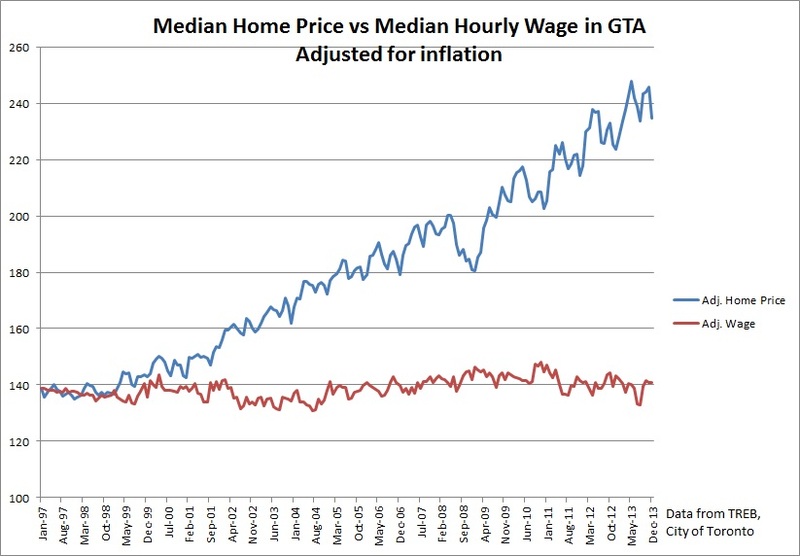 Median hourly wage in the GTA is pretty much the same as it was 20 years ago when adjusted for inflation. Yet home prices are double! Yes, low mortgage rates helped people to afford a house, but they stayed the same more or less since 2009. Average home price in the GTA went up by ~77% (nominal) between December 2009 and December 2016. So something else is in play, and clearly it is not the economics fundamentals as you can see from the above graph. 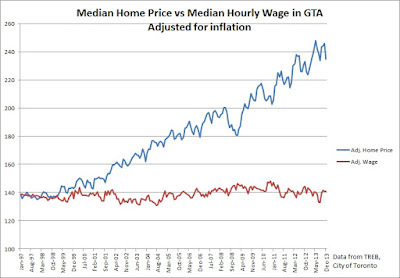 In my view, a two decade long price appreciation in Toronto was not driven by economic fundamentals. Instead it was driven by artificially low interest rates and, most importantly, a belief that real estate always goes up. CMHC is slowly admitting to the fact that housing is driven by things other than fundamentals. Not that they have much choice at this point. But still, I think the people at CMHC always knew what really drove the prices up. But they won't admit that. Ever!